The world of perfumes is a world of mystery and romance, that can sometimes be seen as really classical and serious. Ben Gorham proves it is not and that only imagination rules this world. This tattoo-covered 6.5 foot former basketball player and Stockholm art school graduate has the look of a rock star. And the truth is… He is a rock star who found his way to success when he created Byredo in 2006. Byredo (or By Redolance) had the idea of translating memories into perfumes as a purpose. It is such a perfect idea. A scent can contain a lot of say, childhood memories and it is wonderful to be delivered back to them via a fragrance. But from where did this idea come? Gorham is Swedish by birth, but his mother’s heritage isIndian andd he started being interested by the close relation between scents and memories after travelling into his mother’s hometown. At the time, Gorham did paintings, photographs and sculptures but wasn’t predestined to perfumery, which in the end was the art form that aided him to develop and flourish his ideas. It was the French perfumer Pierre Wulff who convinced him to give it a try. And Byredo was born. Gorham is one of the rare perfumers who never had a formal training. That makes him somehat of an outsider in the world of scent but doesn’t stop him developing as well as challenging this tight knit world. The brand is internationally renowned, as well as being one of the key forerunners of niche fragrances. ‘We built the whole nature of this company on this idea that smell is completely subjective —there is no right and wrong,’ Ben Gorham. In 2016, to celebrate its 10th anniversary, Byredo released an unnamed and genderless fragrance in collaboration with the nose Jérôme Epinette that invites you to remember your roots. 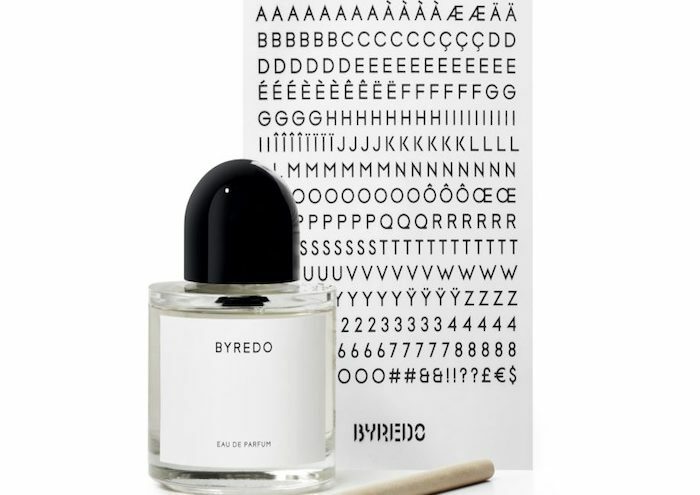 A perfect reminder of why Byredo was created as the idea of a genderless perfume perfectly matches today’s world view. The bottle is colourless and has simple detailing, just like a blank page, the consumer must dive into it and enjoy from it what he or she wants to. The adhesive letter included with the package reinforce this idea and gives the consumer the right to create his or her own story and to title the fragrance themselves. This is a wonderfully playful approach but with a serious undertone. Fragrance is very personal, it speaks to each person on a truly individual level. The idea of constucting in part or in some way a personailasation to your choosen scent is only going to grow. The unnamed fragrance contains fresh and simple ingredients, and when it was released, Ben Gorham refused to give the ingredients to the consumers. For him, the ones who couldn’t identify the ingredients were ‘the lucky ones’. The fragrance being an experience lead by our own emotions, it is better to play the game and give it the meaning we want to. Its almost as if the way he sees it is that if it ‘speaks’ to you then it is for you. More than a perfume it is a memory game that can remind the same person of different things, as well as many different people of the same thing. What a perfect way to illustrate Gorham’s creativity and understanding of scent. Byredo will allow those that choose to play and delve can do so but be careful, it is for a limited time only. Because Gorham is a seeker for perfection, he didn’t restrict Byredo to fragrances. During the Paris Fashion Week in September 2017, he proved again he was a real outsider by releasing a collection of leather bags and small leather goods. To make it even more Rock’N’Roll, the bags were inspired by one of Gorham’s friends and collaborators, the photographer Craig McDean’s and more specifically, his 1999 book I Love Fast Cars about the drag-racing culture. Gorham made then the choice to create and release a larger variety of products. The brand sells now high quality blankets, sunglasses and horn combs for example. Mélusine Estebe-Brunault and Chloe Williams Melusine Estebe-Bruault.